Ford Motor Company owns the two Ford Site properties: A 122-acre property which was home to the Twin Cities Assembly Plant and a 22-acre site next to the Mississippi River. Ford Motor Company sold its former hydroelectric plant to Brookfield Power in 2008. Canadian Pacific Railway owns the 13-acre rail-yard southeast of the Ford Site property, as well at the railway spur that previously served the site. Ford Land manages the Saint Paul Ford property and is leading its decommissioning and anticipated sale. Ford Land and its broker, CBRE, has listed the Ford Site for sale to a master developer. Are you interested in locating your business at the Ford Site? What is "the Ford Site"? The Ford Site is the location of a former Ford Motor Company assembly plant in the Highland Park neighborhood of Saint Paul, Minnesota. Ford refers to the property as the Twin Cities Assembly Plant. The Ford plant operated from 1925 to 2011, starting with the assembly of Model Ts and ending with production of the Ford Ranger. At its peak, the plant employed more than 1,800 people. How big is the Ford Site? 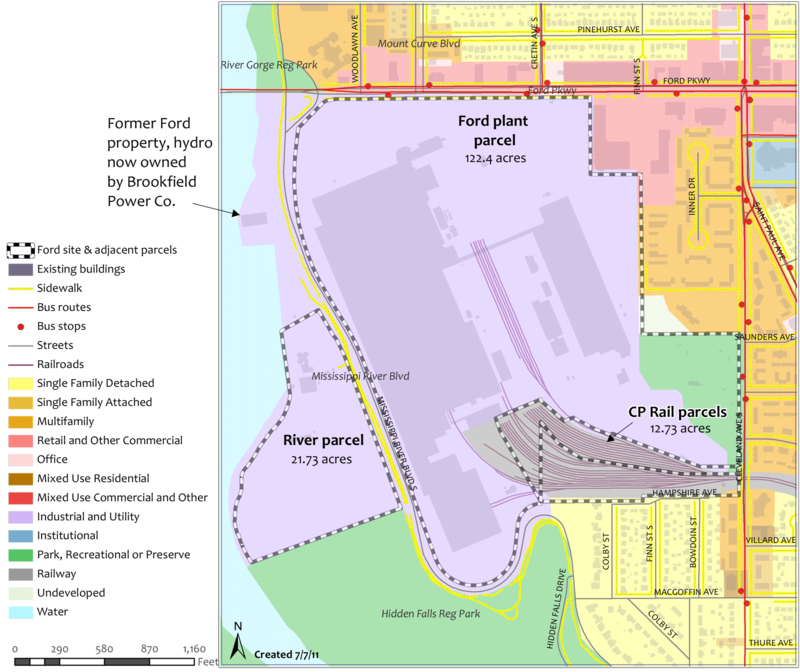 The 122-acre main assembly plant parcel owned by Ford, located south of Ford Parkway and east of Mississippi River Boulevard. The 22-acre river parcel owned by Ford, located along the Mississippi River and up to the bluff edge of Mississippi River Boulevard. The property contains a steam plant and wastewater treatment plant that served the main assembly plant, and a former dump site (read more below under "Contamination" - "Area C"). The river parcel owned by Ford does not include the hydroelectric facility (read more below under "Hydroelectric Plant"). The 13-acre rail yard owned by Canadian Pacific Railway, a wedge-shaped parcel located on the south border of Ford's main parcel. The rail yard and the rail spur to it served the Ford Site for most of its operating years. The City is currently conducting a feasibility study to reimagine the potential use of the five-mile corridor which connects to the site through this parcel. Which properties are being considered for redevelopment? The main redevelopment site is Ford's 122-acre parcel, and with the inclusion of the 13-acre Canadian Pacific Railway parcel to the south, the total comes to 135 acres. Both owners are interested in sale and redevelopment of their properties, but the sales will occur independently. Ford has also listed the 22-acre river parcel for sale, along with the main parcel. When will the site be developed? Infrastructure work (public realm) may begin in 2020 or 2021, with development to happen in phases, based on market conditions, likely over the next 15 to 20 years (through 2030). Does the City own the property? No. Ford owns the site and will sell it to a buyer/developer. A portion of the site will become public right-of-way for infrastructures, like roads and stormwater management. What roles do the City and Ford have for the site? Who else is involved? City of Saint Paul: Established the master plan vision for the site (zoning and public realm plan) to serve as a framework for future proposed development. Guide further planning efforts once actual development is proposed on the property. Ford (including Ford Land and Ford Environmental Quality Office): Manage environmental testing and remediation as the property owner. Prepare the site for sale and manage the site broker (CBRE) and ultimately negotiate the sale of the land to a master developer. State of Minnesota: Conduct an environmental review of the new development and provide regulatory oversight of pollution clean-up. Master Developer (to be determined): Propose actual development on the site consistent with the zoning and public realm framework. What is the purpose of the City’s Zoning and Public Realm Master Plan? The Zoning and Public Realm Master Plan identifies the site’s redevelopment potential and market value to prospective buyers and sets a framework for the phased development, which will likely take place over the next 15 to 20 years. A more detailed development plan, outlining possible phases for redevelopment, will be created by a future developer, once Ford sells the property. What types of jobs could be on the site? Light industry, research and development, custom manufacturing that is not trucking-dependent, and more are envisioned for the site. At full build-out, the site could provide up to 1,500 jobs. Providing a range of employment along with housing and services at the future site will ensure the site's economic value for the city and residents. Learn more in this jobs strategy document, an outcome of the work by the Jobs and Employment Workgroup. Under the proposed plans, how many housing units can be built and how many people are estimated to live on the site? Residential units on the future Ford Site will be a mix of ownership and rental, will vary in size and price, and will target different ages and household types, though much of this will depend on current market conditions at the time of development. Currently, 38% of households in Highland consist of a single person. To meet the demands of this population, the master plan calls for adding a variety of housing choices, including multi-family and townhome units. The plan also includes goals around affordable housing across the site. At full build-out, the redevelopment could include between 2,400 and 4,000 residential units, based on the current plan. This would result in an increase of 4,320 to 7,200 new residents. Note: The 2010 census shows that the average multi-family unit household size in Highland averages 1.8 people, which was used for the estimation of new residents in the redevelopment area. Highland Park has been home to 8-9% of the City's population since the 1980s. The growth proposed in the plan is consistent with Highland's share of the City's population and projected City-wide growth. Are affordable housing goals included in this plan? These goals are in addition to the city-wide affordable housing policy, which applies when a certain public subsidy is invested in a housing project. Find details about this policy in the housing section of the City's current Comprehensive Plan. Will there be park space allocated within the new redevelopment? Yes. The Public Realm plan calls for 21% of the site to be public parks, trails and open space – spread throughout the site to create a vibrant, green development. How did the City decide on the amount and type of open space in the plan? Following the City’s recently adopted parkland dedication ordinance, the City can only legally require 9% of the property to be designated specifically as parkland during the platting process (creating new property lines to subdivide the property into smaller parcels), though a developer could decide to build more parkland than required by City ordinance. Additional land can be set aside for stormwater treatment infrastructure (with park-like qualities) and public right-of-way (roads, bike paths, and sidewalks) in addition to the 9%. This accounts for a total of approximately 20% of the site to be public parks, trails, and open space. What will happen to the Little League baseball fields? The retention of the Ford Little League Fields somewhere on the site is one of the City’s top priorities. Technically, recreation fields are an allowable land use in any of the proposed zoning districts. How will stormwater be managed on the site? The City is actively looking at innovative approaches to stormwater management on a variety of sites throughout the city, with Ford Site redevelopment being a clear opportunity to consider a district-wide system. One of the goals for stormwater treatment on the Ford Site is to “daylight” Hidden Falls in Saint Paul’s Highland Park neighborhood. This was identified in the City’s adopted Great River Passage plan. The Ford stormwater infrastructure plan outlines transformation of the site by featuring a stormwater-based amenity for the community that reconnects the community to parks and the Mississippi River. How much traffic will the Ford Site redevelopment generate? The area is already congested. Is traffic generation being considered as a limiting factor for the amount of development at the site? The City of Saint Paul hired nationally recognized professional transportation analysis firms Nelson/Nygaard, SRF Consulting and Utile to conduct a transportation study how the Ford Site could develop without straining the traffic system in the surrounding neighborhood. The study showed that incorporating a street grid on the site will assist in managing vehicle traffic and provide better connections for pedestrian and cyclists. A robust transportation network will create a connected site that accounts for and enhances the residential element of the existing neighborhood and will ensure a better experience for drivers, pedestrians and cyclists alike – both in and around the site, particularly along Ford Parkway. Ford Site Transportation Study from St Paul Communications Services on Vimeo. The master developer selected for the site will be required to conduct a more detailed transportation study, which will look specifically at how various development scenarios impact transportation access to, from and around the site, and identify tactics to mitigate any concerns. This will take place as part of a full environmental impact analysis, the Alternative Urban Areawide Review (AUAR). This will likely occur in 2019. Is additional transit service being considered for the redevelopment? Yes, enhanced transit service to support the people living on, working at, and visiting the Ford Site is a priority. There is already strong transit service on Ford Parkway, with the A-Line bus rapid transit connecting the site to the Blue and Green light rail lines, as well as multiple bus lines in close proximity to the site. The City will work closely with Metro Transit to look at routing transit service through the Ford Site once redevelopment occurs, connecting it to the area transit network. The potential for a major transit alignment through the Ford Site is being examined in Ramsey County's Riverview Corridor Study and related Ford Corridor Study. What is planned for parking on the site? Parking needs will be met on the site through structured ramps in addition to on-street, small surface lots and alley parking. The draft plan calls for parking maximums and minimums for each building to ensure the right balance of parking spaces on the site. Will environmental review or traffic studies be required for proposed redevelopment of the site? Yes, the size of the site and anticipated level of development will automatically trigger environmental review requirements under Minnesota State Law. The master developer selected for the site will be required to conduct a more detailed transportation study, which will look specifically at how various development scenarios impact transportation access to, from and around the site, and identify tactics to mitigate any concerns. This will take place as part of a full environmental impact analysis, the Alternative Urban Areawide Review (AUAR)This will likely occur in 2019. Is there pollution at the Ford Site? If yes, who will clean it up? Ford and its environmental consultant Arcadis has completed extensive testing for soil and water contamination across the site. Some impacts have been found and are being cleaned up by Ford with oversight from the Minnesota Pollution Control Agency. Ford is cleaning up the site for a mix of uses, including commerce, employment, housing and open space. Some uses, such as residential, may be restricted from parts of the site. Zoning of the site reflects these use restrictions. Cleanup efforts are expected to be complete by end of 2018 or mid-2019. Learn more about the environmental remediation. Is any agency tracking environmental testing and results for the Ford Site? Yes, the Minnesota Pollution Control Agency (MPCA) and its staff are actively tracking the investigations and testing results from the Ford Site. Ford is enrolled in the agency’s “Voluntary Investigation and Clean Up Program” and its “Petroleum Brownfields Program.” MPCA staff review and approve all proposed testing, test results, and remediation cleanup plans and activities. They regularly visit the site to oversee testing and to discuss upcoming work. What public financing has been committed to the site? Currently, there has been no public financing committed to redevelopment on the site. However, the City has preserved the ability to use Tax Increment Financing (TIF) as a financing tool in the future, if needed, to help with the costs of infrastructure and basic public amenities. A TIF Plan was passed in 2016 to preserve the ability to use this tool. It is possible that a developer may request funding assistance when they propose a development plan. Such a request would then be evaluated by third-party finance professionals to determine if and how much funding meets the “but for” test – “but for” the funding, development would not proceed and the land would remain undeveloped. Allocating public funds would then require review and approval through the City Council/HRA, including an opportunity for public input. Who owns the hydroelectric plant that Ford used to help power the former plant? Ford Motor Company sold the facility in 2008 to Brookfield Power, a Canadian firm, which sells the electricity it generates to the power grid. Could the hydro plant provide power to the redeveloped Ford Site? Technically, power from the plant could be directed into a site-based grid at a redeveloped Ford Site. What is happening with the 22-acre Ford property along the Mississippi River, which contains a concrete parking pad and a former steam plant and the wastewater treatment plant? Ford’s river property was not included in the planning study area. Ford is accepting offers for the steam and wastewater treatment plants. The concrete pad, known as “Area C,” is the cap on a former dump. The environmental condition of “Area C” is being closely investigated by Ford under guidance by the Minnesota Pollution Control Agency.